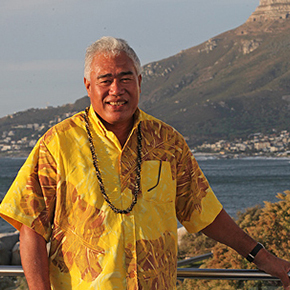 Aliki Faipule Foua Toloa, who passed away in June 2015, joined the Global Ocean Commission in December 2012. His role on the Commission reflected his role in life as a true Ocean soul and advocate for change and action. Foua came from Tokelau, which is made up of three coral atolls with a combined land mass of 10 sq km and a population of 1400 people. In Tokelau Foua had served as the Ulu or Head of Government, on the Commission he was our ocean inspiration, guiding light and spiritual leader for the sea. Attending Commission meetings showed real commitment from Foua as he had to travel over 500 kilometres by boat to Samoa from Tokelau, before he even caught the first of many flights. Despite the distances he travelled away from his home, or ‘paradise’ as he regularly called it, he attended all our meetings and presented at the release of the Commission report in June 2014. At the Commission meetings, as we talked about failure of UN Governance, policy measures and scientific evidence, Foua reminded us not only of his own personal experiences of a degrading ocean witnessed by his own eyes, but also of its beauty and spiritual connection with so many people. Foua was eloquent and thoughtful and inspired the whole Commission and all that he came into contact with. In Foua we have lost a true Ocean champion and leader, and our hearts go out to his family and friends as we share in their sorrow. We hope that wherever his canoe takes him next, his spirit has the same peaceful feeling he had on the second day of his journey when he was young, and without a doubt he will live on in all he inspired.